An adorable little teddy bear which would make a great gift for any little girl or boy. 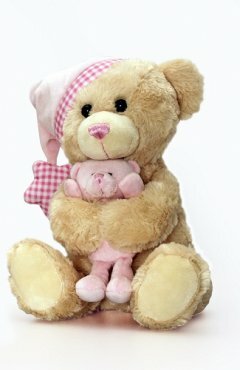 This light tan furry teddy bear is wearing a cute plush hat in pink or blue, trimmed in a printed gingham check. The hat is finished with a gingham star and teddy is holding his or her own little bedtime bear too. This toy is also musical and will help lull baby to sleep.